Over this summer I had some amazing opportunities. I am originally from Milwaukee, Wis., so I was excited to go home for the summer after my freshmen year at Mizzou. I was excited to see my friends and family, but I also had an internship lined up with the fashion editor of M Magazine, a local lifestyle magazine in Milwaukee. Along with that, I had a columnist position for the online magazine College Gloss Mizzou. 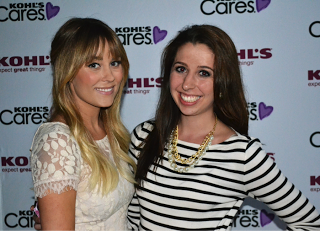 One of my best experiences was meeting and interviewing my idol and role model, Lauren Conrad. She was in town for a book signing and I was so lucky to get to talk to her. Right before my interview was about to start, the power went out. I ended up having to do my interview by a window for light. Lauren was great though, and was so sweet. She even gave some great advice for college girls, like myself. Through my internship I also got the opportunity to help style a photo shoot and interview Victoria’s Secret Angel Erin Heatherton. Overall, my summer was mainly focused on my journalism career. While they were great experiences, I also really learned a lot. This summer really helped me realize what I want to do in the future.